What is the normal length of the forestay? I need to get one made up. With the jib, does it take the place of the stay or is it clipped to it? The length of the forestay depends on the height of your hounds which can vary by as much as 200mm so you have to measure it for your boat. Put the mast up, using a piece of rope that will not stretch for a forestay. Put a spirit level on a hull between the beams and get the boat sitting level. Now hang something heavy from the end of the main halyard. 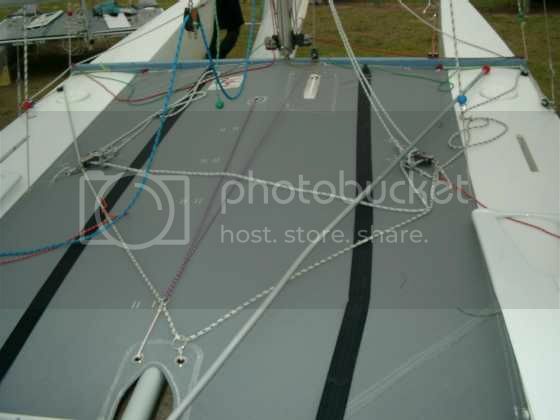 Adjust the sidestays so that the main halyard is hanging 6 inches back from the foot of the mast. Now your mast is in a good position for sloop sailing. Now measure the distance from the hounds to the bridle and take off 8 - 10 cm. That's the length of forestay you need. Don't forget to allow for the length of the shackle at the top (or whatever you have at your hounds fitting). It's fairly common to have the sidestays and forestay all on one big shackle at the top. The forestay gives all the rig tension. The Jib is usually zipped over the forestay. Don't overdo the rig tension. You should still be able to grab the forestay with your hand and twist it 20-30 degrees or so when it's tensioned. Too much tension stops the mast rotating and does bad things to the mast bend. When you go cat rigged you need to rake the mast back some more so the string on the forestay is just let out. That's why you set up the length of forestay with the mast raked for sloop sailing.